How augmented reality (AR) can make a significant contribution to the automotive industry, by cutting development time and the cost was a focal point of the conference presentation on April, 17th. Zumoko company was proud to be a part of the “SEE Automotive Conference – Connect & Supply 2018″ on 17-18 of April 2018 in the “Master” Congress Centre of the Novi Sad Fair! The automotive conference gathered more than 250 participants and representatives from 150 worldwide companies such as FIAT, BMW, KIA Motors, Bosch, Mecafor, Odelo Slovenija, Grammer, Mann Hummel, Novares, FESTO, Mitsubishi Electric and many others. During two-day B2B meetings, Zumoko Team presented augmented reality technology innovation CAD DT for model detection and tracking for Microsoft HoloLens and AR solutions for maintenance, remote assistance, staff training, quality control and inspection. With ZUMOKO CAD DT structured data can be overlaid on the real parts striving for maximum correspondence. Real object and associated virtual information are both visible at the same time and in the same place. Participants were able to identify how augmented reality (AR) solutions, with its disruptive potential, could increase efficiency and productivity in the automobile industry. Most of the manufacturing industries deal with a series of models, versions, and locations with a high demand for production training or product clarification. Increasing complexity of machining and production and amount of required product information are often challenging for industrial companies and their staff. Zumoko provides innovative augmented reality, virtual reality and mixed reality solutions with measurable cost and time-saving benefit, especially for industrial maintenance and training. Mr. Darko Stanimirovic, Founder, and CEO of Zumoko was the speaker of “Digitalization and Automatization” session on the second day of the SEE Automotive Conference. How can staff in service, logistics, and maintenance better perform their tasks with both hands-free and the complex information in front of their eyes was the keynote of his conference presentation. 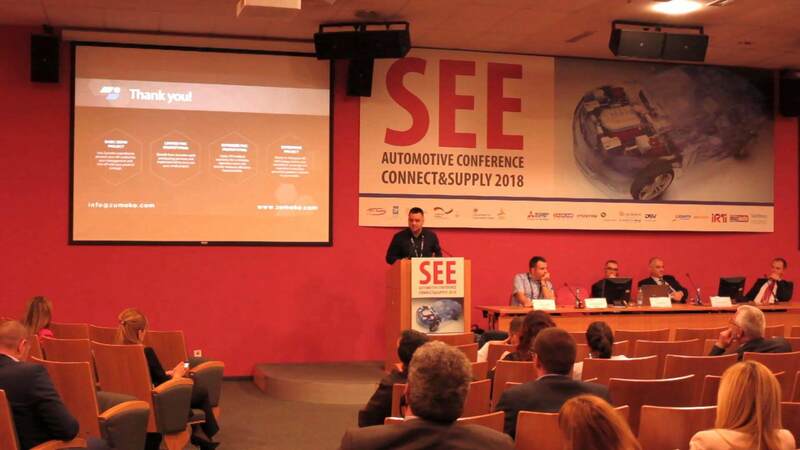 Conference “SEE Automotive Conference – Connect & Supply 2018”, the biggest automotive conference in the wider region of Southeast Europe, was held on April 17-18, 2018, in the “Master” Congress Centre of the Novi Sad Fair. The organizers of the Conference are Serbian Automotive Cluster.